There should always be room for a bit of fun in the school day, especially if it involves exposure to amazing musical skill. My PT today showed me this video of Harry The Piano playing the main theme from Harry Potter in a huge variety of styles – shouted out at random from (I presume) the person doing the filming. This is a great inspiration for pupils, many of whom (along with some teachers) have a dread of melodic improvisation, far less harmonic. I’ve said it before, but feel it’s worth repeating, that the parallels between Music and Modern Foreign Languages (MFL) are not, in my opinion, as straightforward as one would imagine. One might imagine reading, writing, listening, speaking in MFL to equate with reading, composing, listening, playing in Music. I’d contend that a more realistic parallel would be playing, composing, listening, improvising. I was honoured to be able to take part in Sunday’s Saltire celebrations in the fantastic acoustic of St. Mary’s Parish Church, Haddington. 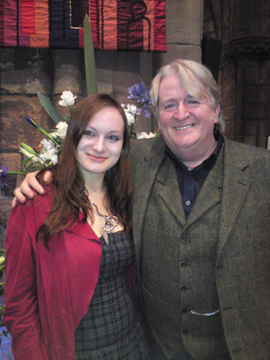 My role was that of accompanist in a performance of Robert Burns’ Ca’ The Yowes sung by Zoe from North Berwick High School (pictured below with performer and MC for the evening, Phil Cunningham). Judging from the reception, the evening’s audience was similarly moved. My colleague and friend, Mike McGeary, got in touch today to alert me to an opportunity for pupils to attend a workshop with legendary bluesman, Joe Bonamassa. Venue: HMV Picture House, 31 Lothian Road (next to Usher Hall). At that time, this was the only arrangement of the song I really knew and, as so often happens, it seemed like the best and only expression of the song. However, on Monday of this week, following another In Service, I heard a contrasting arrangement on the Radio 3’s In Tune – one of those moments when you end up sitting in the car, at the journey’s end, until the song was over. The singer is a sprightly 82-year old Barbara Cook with Michael Kosarin on piano and Peter Donovan on bass. I’m presuming the arrangement to be the work of Kosarin – a celebrated Broadway musical director. You can hear the song here at 27:35 (until it’s over-written by the edition on Monday 2 Nov). What impressed me particularly was the harmony from 28:27 – the arpeggios seeming to capture the giddy relentlessness of romantic obsession. Former Knox pupil, Simon Thacker, is currently gathering together an East/West ensemble entitled the Nava Rasa Ensemble for a ten-date tour (details here). The programme, Inner Octaves, will feature music by Shirish Korde, Terry Riley and Nigel Osborne. Simon is never one to shy away from technical or musical challenges and this promises to be an unique evening – and one to remember. Haddington-based guitar teacher, Liz Mercer, is putting on a weekend of events featuring her former teacher, Carlos Bonell. 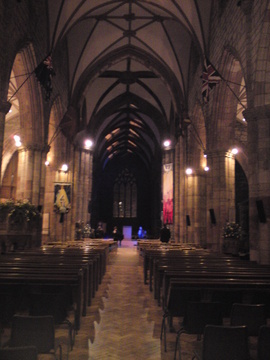 Children’s Matinee Concert in St. Mary’s Church, Haddington. Ticket price £7 per adult, which includes entry for two children. Masterclass in Town House, Haddington. Participant price £15, Observer price £9. Tickets can be ordered directly from Liz, using this booking form which contains all necessary contact details. Radio 4 is broadcasting a series of five short programmes this week (Mon – Fri, 15:45 – 16:00) about guitar style and technique. Each day, Joan Armatrading discusses playing ideas, tunings etc. with one of five players: Mark Knopfler, Bonnie Raitt, John Williams, Russel Lissack and Bert Jansch.